This chapter discusses developments in Argentina and Mexico implementing the Inter-American Court’s “control of conventionality” doctrine. These developments illustrate the perspective of domestic courts in these states, which appears to be markedly different from that of the US Supreme Court in Medellin v Texas. 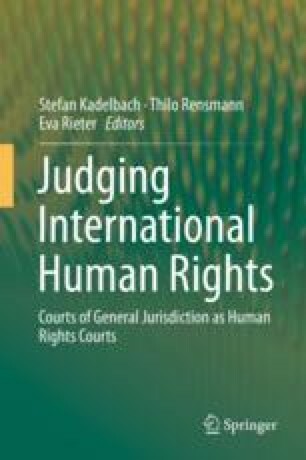 While the latter doubted that other states treat judgments by international courts (in that case the ICJ) as binding in domestic courts, the domestic court cases discussed in this chapter indicate otherwise and make concrete the obligation that treaties are to be complied with in good faith. In 1994, Argentina reformed its Constitution and granted international human rights treaties to which it was party equal status with the rights protected by the Argentine Constitution. In 2005, the Argentine Supreme Court declared its amnesty laws unconstitutional, applying the Inter-American Court’s holding in Barrios Altos directly. Similarly, Mexico, in 2011, reformed its Constitution and incorporated international human rights from international treaties to which Mexico is a party and gave them constitutional standing. On August 21, 2012, a majority of the Mexican Supreme Court held that human rights violations and other crimes committed by military personnel against civilians will now be subject to prosecution in civilian, not military, courts in accordance with the Inter-American Court’s jurisprudence in this area.